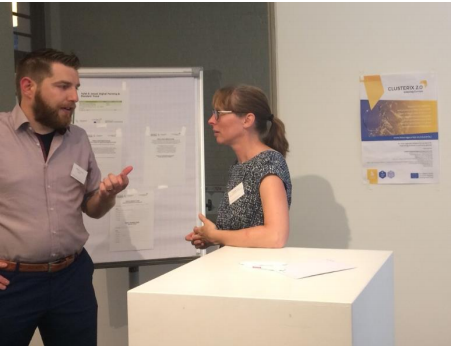 On June 22nd, Flanders Innovation and Entrepreneurship hosted in Brussels a stakeholder meeting for clusters, attended by 50 representatives of 30 (cluster) organisations. This event, which addressed the main theme ‘internationalization’, included presentations from several experts as well as a matchmaking session to find potential project partners, brainstorm and finetune ideas. 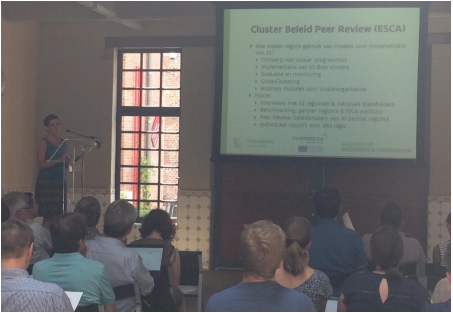 The event also served as a stakeholder meeting for the Interreg Europe project CLUSTERIX 2.0. 50 representatives of 30 (Cluster)organizations attended the meeting. The aim of this meeting was to present the cluster representatives relevant information about how to improve their activities at international level, as well as to strengthen their network and increase the opportunities for future collaboration with other clusters. Mrs. Annie Renders presents ClusterIX2.0 and the peer review by ESCA. For this meeting, several experts were invited to talk about topics related to internationalization. Guests included experts from Flanders Innovation and Entrepreneurship, the European Fund for Regional Development, the Enterprise Europe Network, Flanders Investment & Trade, and a Belgian expert of the European Cluster Excellence Initiative (qualified auditor for ESCA Cluster-labelling). As a strong supporter of the internationalisation of clusters, the ECCP (European Cluster Collaboration Platform) was introduced by Eurotop. Together they presented an overview of support mechanisms for clusters to promote and expand their businesses at international level. Additionally, an update was given about the CLUSTERIX 2.0 project, including a presentation of the results of the ESCA policy review study. Mr. Jacques Viseur, introducing the European Cluster Collaboration Platform, highlighted that although many clusters have been created in Flanders, only few use the platform. Since the platform is home to approximately 650 cluster organisations throughout the world, it can help their companies to address international challenges, find partners and missing links in their value chains, extend their markets and create added-value through knowledge. Local governments can play a role in this process, by raising awareness and looking at similar clusters in other countries. Mr. Peter Simkens (DSP Valley) at his turn, mentioned that all support mechanisms and services presented during this meeting have supported his own cluster during its internationalization efforts. After the inspiring presentations, participants could eperience how these can be put into practice in a so-called matchmaking session. During these sessions, the clusters presented their cases to potential partners in order to discuss and fine-tune their project ideas, research questions and desired collaboration to create an added value to their work. This matchmaking session aimed to stimulate interaction between clusters towards results in new innovation projects. More specifically: shared projects for the launch of a new project call focused on cross cluster collaboration projects. Accompanied by food and drinks, 15 project ideas were launched, resulting in 20 potential matches and 17 mini-dates to discuss project ideas. There was space for spontaneous meetings as well and the attendees brainstormed right until the end, before the venue closed. For more information about the Flemish clusters, please visit our website. The presentations (in Dutch) can be found here.